At Cool City Air Conditioning in El Monte, we offer heating repair and installation services. 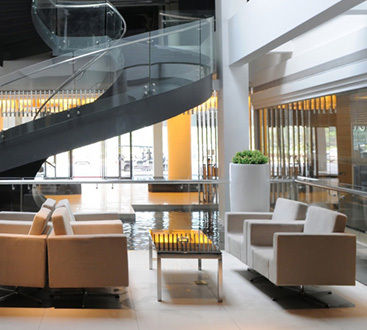 We’ve been serving the El Monte community since 1979, and we’re committed to going the extra mile for clients. Whether you need quick furnace maintenance or large-scale industrial furnace repairs, we can help. We also perform heater installation, so just give us a call today to schedule HVAC service in El Monte. For the last 40+ years, Cool City Air Conditioning has been providing quality HVAC service to the Los Angeles Community. Though “air conditioning” is in the name, we also offer a range of heating services for El Monte homes and businesses. When you work with Cool City Air Conditioning, you’re working with the Top Rated Local® HVAC company in Los Angeles. Give us a call today or book online to schedule heating service with us! Heater installation is one of our primary service areas. Although El Monte is known for its temperate climate, it’s not worth the risk to be caught without a functioning heater. That’s because heating systems not only keep your family comfortable, but they also protect your home and its pipes. In general, furnaces have an average lifespan of between 18 and 20 years. While some furnaces that have been properly maintained can last longer than 20 years, this is the general rule of thumb. Increased utility costs — older furnaces, no matter how well they’ve been maintained, just don’t run as efficiently as newer ones. If you notice your utility bills rising, it’s time. Expensive maintenance — if the cost of heater maintenance is 50 percent of the cost of a new furnace, you should replace the furnace. Frequent maintenance necessary — for older furnaces, repairs might not be 50 percent of the cost of a new furnace. But, what if you continually are paying 10 percent of the cost of a new furnace every month or so? Frequent maintenance means you should get a new furnace. When you decide it’s time to replace your furnace, you’ll have another decision to make: what type of new furnace to install. Gas Furnaces — the most popular furnace option, natural gas furnaces use gas pipes connected to the municipal gas line. Because gas is generally affordable, gas furnaces don’t cost much to run. Oil Furnaces — for homes without natural gas lines available, oil furnaces are an alternative. In general, oil furnaces are not as energy-efficient as gas ones, though they do work. Electric Furnace — electric furnaces, as the name suggests, use electric elements to transfer heat. They’re another alternative for homes without gas lines. Modulating Furnace — modulating furnaces use a feedback loop to regulate the amount of gas burned. This way, modulating furnaces waste less energy by running steadily at low levels. If you have a newer furnace or aren’t ready to replace an older one, furnace repair might be necessary. Low airflow — does it seem like your ducts just aren’t producing enough air? If you have low airflow, there’s a chance that your furnace fan or fan motor is out of whack. Blocked ducts or ineffective fans will cause your furnace to run more, causing utility bills to go up. Strange noises — whether it’s a clanking sound, a squealing noise, or a dull rattle, there are a few sounds your furnace shouldn’t make. If your furnace sounds out of the ordinary, it’s time to call a local HVAC company. High utility bills — if your utility bills are higher than normal or have been on an upward trajectory, a faulty furnace might be to blame. 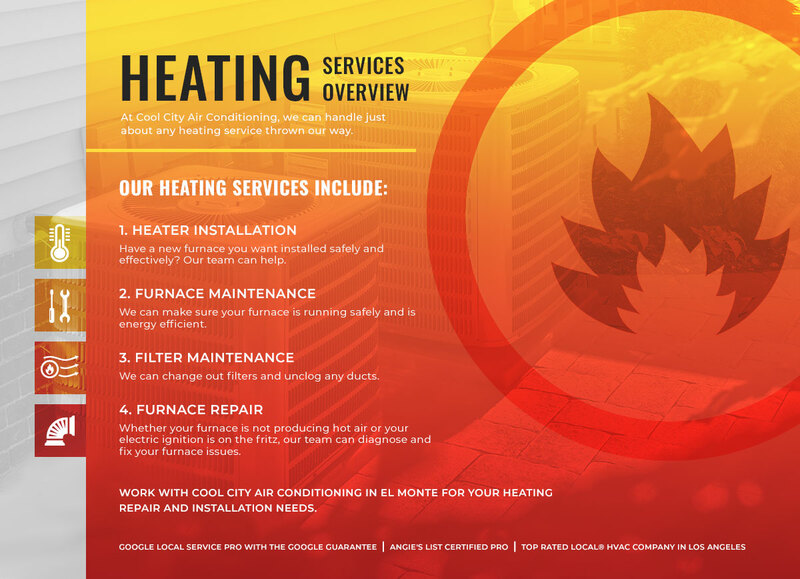 For heater repair in El Monte, contact Cool City Air Conditioning today. Cool City Air Conditioning has been a fixture of the El Monte community since 1979. To stay in business for almost a half-decade speaks to our commitment to customers, expert technicians, and convenient scheduling options. Whether you know you need to install a new furnace or you’re not sure about a sound your heater is making, our HVAC team can help. You can call us if you’d like to speak to one of our staff members, or we also feature a convenient online booking option. Work with the Top Rated Local® HVAC company in Los Angeles today.